Israeli scientists claim they will develop a cure for cancer within the next year – an unlikely prospect, according to world leaders in cancer care and treatment innovation. Today, Accelerated Evolution Biotechnologies Ltd in Israel claims to have proved him wrong, using a web of small protein fragments called peptides which can wrap around cancer cells like an octopus, attacking tumors from multiple angles and reaching areas that other treatment molecules are too big to get to. They say the peptides are so delicate that they should fly under the immune system’s radar, preventing counter attacks from the tumor and side effects like nausea and ‘chemo brain’. Critics say the method is promising and not unheard-of but claims of a ‘cure’ are wildly overstated since the only study was performed in mice, nobody has seen the results of that study, and even the inventors admit human trials will take years to start and complete. What’s more, it’s improbable that we will ever develop one singular cure for all cancers, which vary widely. ‘It goes without saying, we all share the aspirational hope that they are correct,’ Len Lichtenfeld, MD, chief medical officer of the ACS, told DailyMail.com in an email, and since published on his blog. The researchers have not published data to back up their claim that this is the most promising treatment to date. The only words published on their ‘exploratory experiment in mice’ is an interview they gave to local paper The Jerusalem Post, claiming success. That is not enough to warrant excitement or even intrigue, says Dr. Vince Luca, assistant professor of Cancer Biology at Moffitt Cancer Center. 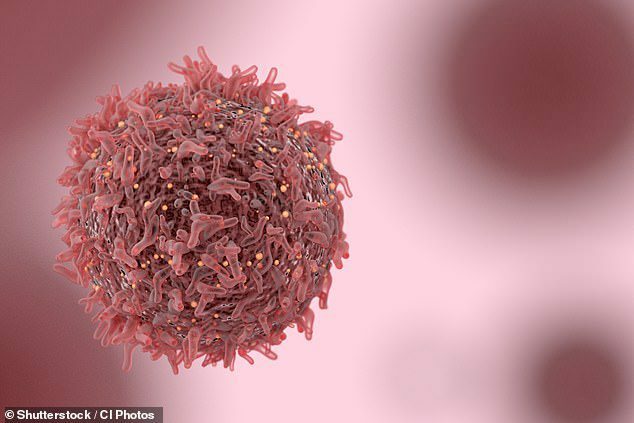 ‘Peptides are a rapidly growing class of therapeutics, yet very few peptide-based drugs have received FDA approval for oncology indications,’ Dr. Luca told DailyMail.com. That’s not to say it couldn’t work as a treatment in some capacity. But Dr. Lichtenfeld warns there is a big difference between finding a treatment with potential and making it work. ‘Our hopes are always on the side of new breakthroughs in the diagnosis and treatment of cancer,’ Dr. Lichtenfeld said. ‘We are living in an era where many exciting advances are impacting the care of patients with cancer. We hope that this approach also bears fruit and is successful. ‘At the same time, we must always offer a note of caution that the process to get this treatment from mouse to man is not always a simple and uncomplicated journey. Even despite the huge gains made in cancer treatment innovation, we are still far off eliminating the disease, with more than 18 million new cases a year and 8.2 million deaths. Immunotherapy is the new wonder treatment, winning the Nobel Prize last year, as it trains the patient’s immune system to fight cancer itself, getting around the issues of the patient’s immune system reacting to drugs. But that is expensive, still being rolled out into mainstream care, and even the inventors, James Allison of the US and Tasuku Honjo of Japan, would not market it as a cure. Aside from that, there have been steps to more directly deliver drugs like chemotherapy to the tumor to prevent arduous and sometimes excruciating side effects. Currently, the top FDA-approved method to do that is with antibodies, which have been perfect vehicles for delivering targeted drugs. However, the antibody molecules are often too big to reach the brain for brain tumors. And antibodies have a tendency to bind to parts of the immune system that can have toxic effects on the liver and bone marrow. Peptides, amino acids connected in a chain, have been held up as a perfect alternative. They are cheap to make and regulate, are less likely to cause side effects, and they can effectively home in on specific sites without affecting surrounding areas. Three peptides are already used to treat elements of cancer – mainly targeting hormones that feed tumors, while other drugs do the tumor-killing. However, many see the potential in peptides to one day do everything in a multi-pronged attack – and that is what the Israeli team claim to have achieved. The big problem with peptides, according to a study published last year, is that they are often too delicate to be a match for tumors, and they have short half-lives, meaning they don’t have the stamina to deliver a sustained attack on tumors. Attempts have been made to extend their half-life and strengthen them, but thus far to no avail. ‘My colleagues here at ACS tell me phage or peptide display techniques, while very powerful research tools for selecting high-affinity binders have had a difficult road as potential drugs,’ Dr. Lichtenfeld said. WHAT IS DIFFERENT ABOUT THE ISRAELI TEAM’S ATTEMPTS – AND WHAT ARE THE CAVEATS? Accelerated Evolution Biotechnologies Ltd (AEBi) has not conducted any human clinical trials and has only completed one study on mice, according to their profile in the Jerusalem Post. That is far from what is needed to establish a worthy treatment, let alone a cure. As a result, most cancer experts will dismiss the study as, at best, a work in progress. Claims of a cure are, at best, an overstretch. However, the methods to build on research into peptides for cancer care and deliver some fresh ideas on how they could be made stronger. CEO Dr. Ilan Morad compared the method, which he calls MuTaTo (multi-target toxin), to the drug cocktails used to target the AIDS virus from multiple angles at the same time. ‘The probability of having multiple mutations that would modify all targeted receptors simultaneously decreases dramatically with the number of targets used,’ Morad said. COULD THIS TREATMENT EVEN REACH CLINICS WITHIN A YEAR? There are many elements to complete, that is a tall order for a 12-month schedule. First, Aebi says it is trying to patent specific peptide structures. Second, they are aiming to conduct human trials which, they say, will take a few years. Thus far, they have conducted petri dish tests and their ‘first exploratory mice experiment’. Third, the aim is for the treatment to be personalized, taking biopsies from the patients to work out which receptors need targeting. That will take time to craft. Dan Aridor, chairman of the board of AEBi, insisted their results are ‘consistent and repeatable’, adding: ‘We believe we will offer in a year’s time a complete cure for cancer. But Dr. Lichtenfield warned readers should take the claims with a sizeable pinch of salt. It is hardly the first time a team has said the same. More importantly, it’s unlikely cancer will ever be cured with one silver bullet given the myriad of different types of tumors, locations, and diseases. ‘There’s a lot of things we can’t control,’ Dr. Shelley S Tworoger, associate director of the Population Science division at Moffitt Cancer Center, explained to DailyMail.com in an interview last month. That could allow us to push the preventable types ‘off the table’ and focus resources on other types. One day we may be able to better control cancer, and perhaps reach a point where they become similar to a chronic disease, like HIV. But one pill to nip them all in the bud like antibiotics – as this Israeli team envisions – is improbable.